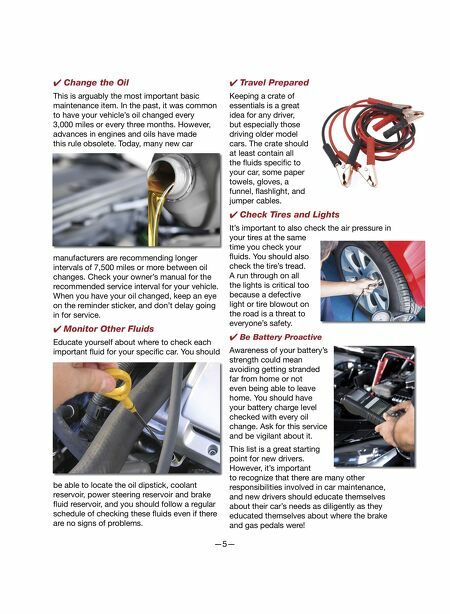 —4— 8 Auto Maintenance Tips for New Drivers O btaining a driver's license is a rite of passage in our culture, and it marks an exciting transition to independence and opens a world of choices. Like most milestones in life, this one comes with new responsibilities, including driving safely, under- standing the rules of the road, and a solid car maintenance plan. Here are the top eight basic car maintenance habits for new drivers to stay safe and happy on the road. ✔ Read the Owner's Manual Okay, read- ing it front to back would be boring, but skim it and read the main sections, returning to it often for a brush-up or any time something seems "off" when you are driving. ✔ Keep an Eye on the Gauges This generation of cars has the most useful information on the dashboard than ever before, so it's important to use that knowledge to know your car and its needs. ✔ Take the Gauges Seriously While this should be obvious, even experi- enced drivers occasionally push their luck when the gas gauge eases over to the "E." If a light comes on and you do not know what it means, check the owner's manual. If the Check Engine Light or its equivalent lights up, pull over as soon as possible and have your car checked out.